Snippet Saturday? Let’s go the full monty! A week or so ago I asked my Tweeps and Facebookers how they’d feel if I released “Castaway 3” earlier than the proposed Monday, July 22 date and they were, hmm, fairly gung-ho on that idea. I wasn’t sure if I’d be able to do it because of RWA, edits, and not having the cover art in, but miraculously the stars aligned and everything came together all at once. So I figured, what the heck. 😀 In appreciation for taking so long this time, the latest part is ON SALE AT $.99 until next Wednesday, so better hurry! All I ask is that you pretty-please remember to review: let me know what you think!! This is the penultimate chapter of “Castaway”, and with only one part left (with no cliffhanger book endings this time!) the story is winding down (while winding up to its climax! …no, not that one lol). Secrets are revealed in the thrilling third part of the Anything He Wants: Castaway series! Every action has its consequences, and the day of reckoning has come. Jeremiah Hamilton is not a man inclined to forgive, and a broken-hearted Lucy is left shattered and desperate to get back home to her mundane life. There, she can nurse a broken heart and try to go back to normal far away from danger. But the promise of safety is an illusion. Someone has marked her a target as surely as any Hamilton male, and believes her to be their key for revenge against the family. There is nowhere Lucy can hide, but her help comes from a most unlikely source. With lives on the line, can they outwit a predator who is constantly one step ahead of them? I just feel the need to add this because OMG OMG OMG SQUEEEEEEEEEEEEE!!!!!!!!!!!!!! 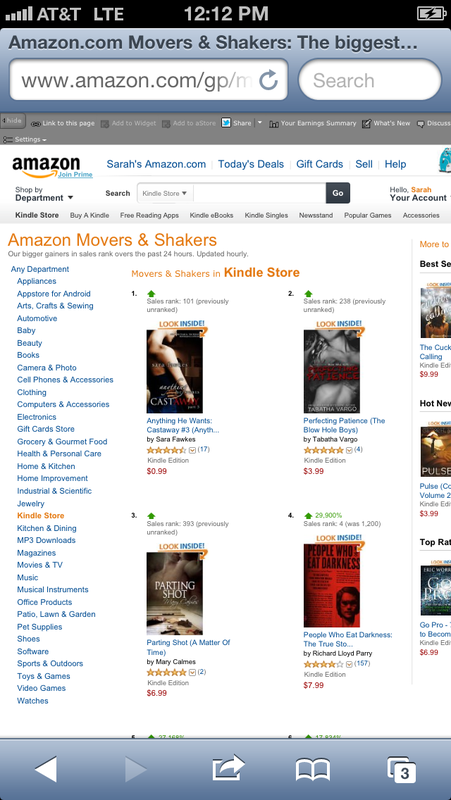 I’m currently #1 on the Kindle Movers and Shakers list, over the ENTIRE Kindle store!!!! Already finished Castaway 3!! It was awesome!! Well worth the wait!! Can’t wait for next book! Love this story!!!! Loved Castaway #3, I can not wait for the last book to see how thing turn out, I have loved reading every book, but I think this is my favorite one thus far!! Please don’t keep us waiting to long for the last of this wonderful story. So this inside look is the snippet? I read it yesterday and I loved it, but you disappointed me saying snippet and I don’t see one. I’ve said it before and i’ll say it again you rock ms Fawkes. Sara I am such a huge fan of ure books. I love the AHW series the story is amazing can’t wait for the final book, alk I ask is please make this book atleast 2 chapters longer I’m nfot ready to finish the series. Lol but great work and ure such an awesome writer. OMG! Totally worth the weight but I can’t wait for the next one. Please promise the last part will be longer!!!!! Cause I always want more!!!! Excellent job and worth the wait!!!! Thank you Sara! Sara I absolutely love the story! Excitement is filling the air!!!! You are amazing! OMG!!! I loved it….. In so excited that Jeremiah and Lucy found there way back together. I love this past of AHW and I’ve spread the word to get others to get their copies today. I can’t wait for the next installment. Wow! Wow! And did I mention, Wow? Are you really making the next installment the last? I can’t believe you can wrap it all up in just one more. There are so many ways this could turn out, so many other story lines. More fantastic writing, as usual. Really Sara? You are killing us lol. I loved it i just read part 3 i was so into it i freaked on her last statement and boom it left me HANGING. Thanks lol I love it. So do i have to wait several months for the answer??? Oh my gosh, read this book in an hour last night before I went to bed, and I ‘m glad I did! Thank you so much for putting these two back together, I knew there love was going to actually win out over everything else, but I was really happy Lucy didn’t just automatically give in to Jeremiah to. everything needed to be out in the open, so they can move on.. I can’t believe the next installment is the end, So could you please make it several chapters longer, it’s going to be hard to see this story end. but oh so looking forward to the next book. Thanks again Sara, keep up the good writing. Loved castaway 3…love Lucy and Jeremiah and Loki….need more…cant wait for the rest…. I loved!!!!! Thank you for so good story. Hey, I started reading this mini series when the first book was free on google play. best decision i’ve made lately on reading! i check every saturday for new anything he wants snippets and news. for the past week its been non stop so i could buy castaway 3 online. As usual i wasnt disapointed! Great writing, fantastic cliff hanger! Loved loved loved it! (only one comment: could you do another small jeremiah pov at the end sometime!?) i really enjoyed that! Sara!!!! I loved it!!! You should totally make this into a movie!!! I cant wait for the next book!!! OMG, OMG, OMG!!!! I can’t handle the suspense! Another fabulous installment. Can’t wait for the next/last one! I just finished reading Castaway 3. I loved it and can’t wait for the next one. ❤ Sara you are an amazing writer. Thank you for writing such a great story. I have been hooked on this book since the beginning. I am up till the wee hours of the morning reading cover to cover. I am glad to hear there is one more to go. This certainly has my blood broiling.that is a good thing I guess but I need relief from this climax. Loved it. Can’t wait for the complete book. I started to read Anything he wants again. Please forgive me!!! When will it be out on IBook? I am dying over here!!!!!!!! SIGH, Me Too…2nd night in a row I come home from work and check ibooks/itunes to see if the book is available yet and Nothing..I am not impressed with itunes/ibooks taking so long. I Downloaded the kindle app for the iPad and purchased my book through amazon and read it already. I was waiting as well couldn’t wait so kept looking for a way to get my hands on the book till I finally did. Great book! Jeremiah needs to just come out and tell Lucy that he loves her already! Enough with the wishy-washy. UGH!!!! Can’t wait for the next book! Love luv the books… you are the Queen of cliffhangers!!!!! The moment that Lucy saw Alexander in the bar to the very end I thought I was dying .. serious as a freakin heart attack… Plzz plzz tell me Castway will finish in the next book (**and will have 500 pages because the suspense and abrupts ending are the death of me but I dont want it to end**) .. and you already are publishing it .. plz plzzz.. i dont take I can wait! When will AHW9 be out ?? Love! When is the last one due? Will Lucas get his own story? Sara you’ve done an amazing job once again. We all appreciate your hard work and dedication, even whn u had that rough time in between all this, u still came thru for all of us. Cant wait for this next serial and I’ll b anxiously awaiting the next book to this awesome story. The end of castaway doesnt necessarily mean end of AHW, right? I have been checking all weekend and all day today..Castaway 2 is still not available on iTunes/ibooks….So Very Sad and very frustrated with Apple. I just wish the all released at the same time! Apple has been really good with other books. I just it was here already! It took me a day and a half to finish castaway 3 and as usual I loved it!!!!! I just wish the books had more than 4-5 chapters. I read through the books so quickly. I can’t wait for the next one to come out!!!! Sara when do you think the next one will be out and how many more do you have after castaway 3?????? Truely Amazing, Gripping And Just WOW! Sara, I love, love Castaway 3!! Congratulations!!! I can´t wait for the next!!! Thanks….You are the best!!! I’m so glad you put this out earlier. I finished Anything He Wants, the novel, in record time and the cliff hanger was such a doozy for me! When I found out that Castaway was made available in increments I bought all three! Lol. It’s a really good series and I love what you’re doing with it. We appreciate all you do. I can’t wait to read the next book. Will there be a love triangle between the brothers and Lucy.